Hello, crafty friends! I'm here today with a layout to share that I created using some Coloringz, Aqua Huez, and Acritonez and a few wild photos, ha ha! 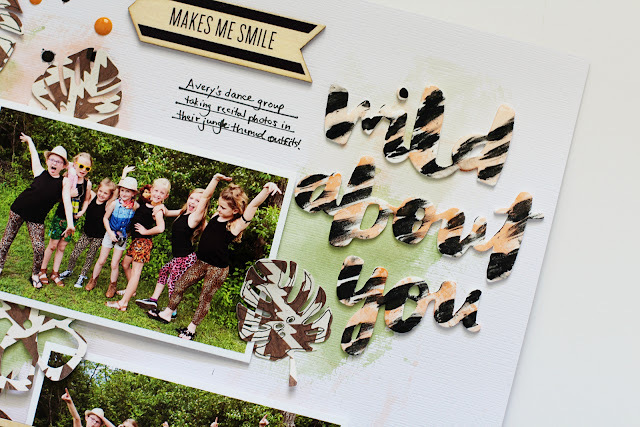 As you can tell from the photos that I chose to use, I was really inspired by the "jungle theme" and the colors from my daughter and her dance group's outfits! 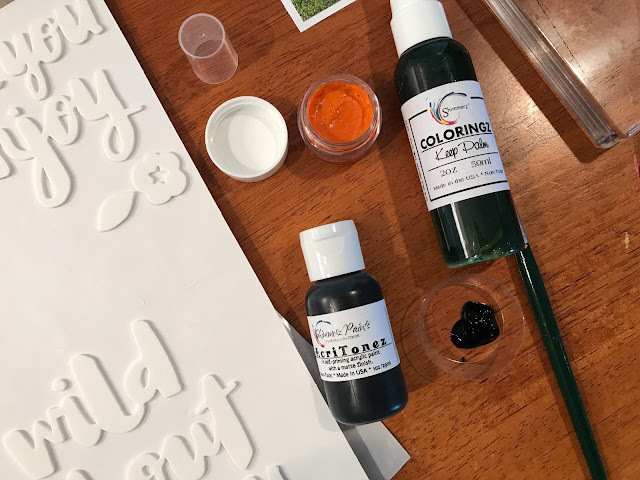 I used some Coloringz in Keep Palm, a non-shimmering, highly pigmented spray ink, to create a light green, earthy background using the packaging technique and then layered some Aqua Huez in 14 Carrots on top of the Keep Palm for a little added color contrast. For my title, I simply grabbed a few foam letter stickers from my stash and took a dry paintbrush and some Acritonez in Shimmerz Tar, Tar and swiped the paint across in a striped pattern. After the Acritonez self-priming acrylic paint dried on the letters, I used some more of the Aqua Huez in 14 Carrots, which is a non-shimmering watercolor, to add some orange to coordinate with my page. I placed several die cut palm leaves around the photos and sprinkled a few ink splatters around using some Coloringz in Night Moves. I embellished my layout by adding some orange enamel dots around the black ink spatters and placing two large wood veneer sentiment pieces at the top and bottom of my page. This color scheme was a little out of my comfort zone, but I just love how well it coordinated with the photos of my daughter and her dance group, don't you? Thanks so much for joining me and I hope you have a wonderful day! Your layout is so fun and fabulous!! It may be out of your comfort zone but it shows your talent and this fab pics off so well!